I can’t believe how time flies. I have been a grandmother for a whole year already, and it has been such a wonderful experience. If any of you, who are reading this post, are already grandmothers, you know exactly what I mean. Those of you who are anxiously awaiting for this honor to be bestowed upon you, I am suggesting to hold on tight, and patiently wait your turn, because it is worth every second, and you will feel blessed. 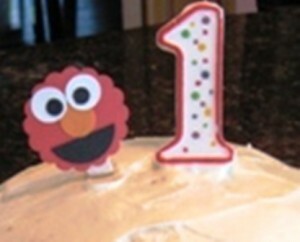 So, my granddaughter turned one, and of course there was a celebration. I wish I could share pictures, but I have made a decision right from the start of my website, that I will not be posting any personal pictures…thank you for your understanding and support. 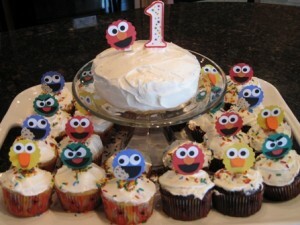 But I will share some pictures of the cupcakes and favors my daughter prepared for her little darling’s First Birthday. The theme for the party decor was Sesame Street Characters, so of course, it started with an invitation, and carried over to the cupcakes and favors, and here they are. This invitation was the first step in the realization of the plans for the birthday party, which also gave everyone the insight on the theme of the upcoming party. This invitation was created and constructed by my daughter, which also contributed to the expansion of her craft supplies inventory, and gave her a good excuse to visit the craft store more frequently. Half of the cupcakes were vanilla flavor and the other half were chocolate flavor, to please everyone equally. My granddaughter had her very own small birthday cake to eat…….. and mostly to play with. If you ever attended a First Birthday party before, you are well aware of the traditional cake eating ceremony by the Guest of Honor….it’s quite entertaining !!! The favors consisted of the Birthday Girl’s empty food jars, filled with M & M’s , and decorated with cut outs, which my daughter prepared with her craft tools and supplies (she loves stamping, scrapbooking, quilting, etc. ), and a ribbon with a cute “Thank You” note attached to each jar. 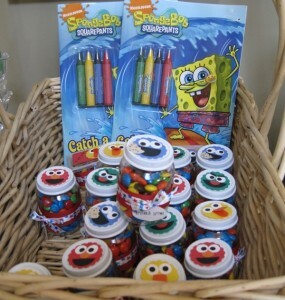 The children received plastic jars (for safety reasons of course), and the adults were trusted with the glass jars. Then the gifts came….. lots of them….and as you can imagine, the most fascinating thing for a One Year Old is the tearing off of the wrapping paper, and not so much the contents of the packages (hmmmm….strange how this changes as they grow older…..). I am so proud of my daughter, that in spite of her busy schedule of being a professional career woman, working full time, she was able to put so much love and effort into the party planning for her daughter’s First Birthday. To top it all off, she prepared a beautiful selection of hors d’oeuvres, plus a scrumptious full course meal, for her and her husband’s family, all 20 of us. Her husband is a wonderful support system for her, so my hat off to him as well. Wow your daughter did an amazing job…I love the little jars they are so cute. I love everything! Your granddaughter will have some wonderful memories and parties for years to come. I def understand your reason for not posting personal photos. I have just started to post pics of myself and my fiance…but we dont post any pics of his kids. 🙂 Here is a pic of the dress I picked out!!! This one on the model is white but mine will be ivory…I didnt get the chance to take pics of me wearing the sample! But here is the link of the model! 🙂 Have a great day. Thank you Diana for stopping by, and for your beautiful comments, as always. Thank you for the link to sneak preview your wedding dress…..absolutely gorgeous!!!!! You will be the most beautiful bride. I can picture you now, with your delightful smile from ear to ear…. Hi there! I met you @ the St. Patty’s Day party – Just wanted to tell you that I have been checking out your site – this is great!!! Have a Happy Mother’s (and Grandmother’s) Day! Thank you so much Jocelyn. Yes, I remember the discussion we had about the name of the site…..being a grandmother and living in the suburbs…(lol). So sweet of you to stop by and check out my posts. Thank you for the Mother’s/Grandmother’s Day wishes. The three of us had a tea lunch at a local British Tea Room….more details coming up. Sounds like you liked the idea. Hi! I just love those labels that you put on your favors. I am looking to do the same thing. Where did you get those!!! They are perfect! My daughter made these out of construction paper. She used her card making tools as her cutting tools.